Lucy Parham discovers how literature inspired Schumann to write some of his celebrated piano cycles - Papillons, Carnaval, Fantasiestucke and Kreisleriana. Launching Radio 3's Schumann 200 season, pianist Lucy Parham discovers how literature inspired Schumann to write some of his celebrated piano cycles - Papillons, Carnaval, Fantasiestucke and Kreisleriana. 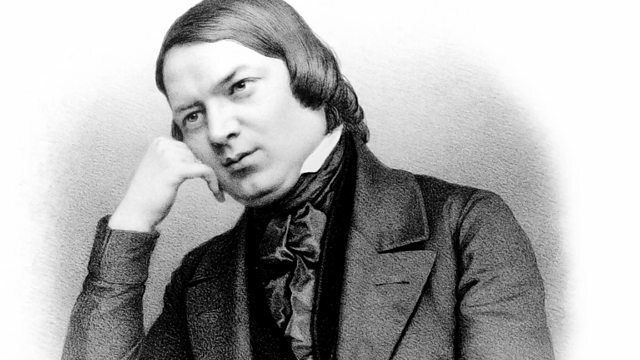 In the 200th year since Schumann's birth, this feature looks behind the music. Schumann turned to the novels of Jean Paul and ETA Hoffmann to access a fantasy world of dual personalities, the ordinary becoming extraordinary, humour and irony. This inspired him to write some of his most idiosyncratic and ground-breaking piano works. Lucy Parham is a well known Schumann interpreter and artistic director of Schumann festivals. She reveals how literary links have shed new light on her interpretation. Visiting Schumann's birthplace in Zwickau, Lucy looks at Schumann's extraordinary collection of books, immaculately preserved, including a novel by Jean Paul, Flegeljahre, with annotations by the composer. A description of a masked ball from this book became Papillons. Also in the collection, she discovers Shakespeare's Macbeth and looks at a score with a quotation from Macbeth in Schumann's hand. As the director of the museum Thomas Synofzik explains, Schumann could never have written music without literature and he might well have become a writer. Lucy plays Schumann's music in the museum, on a piano from 1860 played by Clara Schumann and belonging to the Wieck family, and talks about how her intepretation has deepened. The feature includes insights into German literature from academics Ricarda Schmidt and Erika Reiman and the writer Laura Tunbridge. Throughout the programme you hear Schumann's own words, and passages from the books he turned to for inspiration, read by the renowned actor and music enthusiast Henry Goodman. Why Do Women Die in Opera?